In the last ten years the growth of the internet has meant that a world of possibilities is available to anyone in the comfort of their own home. Shopping, communication, banking and making friends - it can all be done at the click of a mouse. However, allowing the world into one's home comes with risks and care must be taken to use the internet safely. 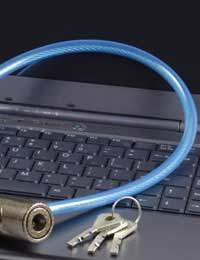 Firewalls give basic protection which can prevent others gaining access to personal information stored on a computer. Firewalls should prevent most hackers and some viruses. Anti-virus software is essential to protect against viruses which can attack a computer through incoming emails or whilst users browse the internet. It may also monitor for spyware, which reads private information stored on a computer. Anti-virus software must be kept up-to-date to ensure maximum effectiveness. Anyone browsing the internet without anti-virus software is at extreme risk of online crime. A wireless - or Wi-Fi - connection must be security-enabled to prevent others using it illegally to access the internet - or to view information stored on the owner's computer. Spam emails have become a part of life - at best they are a nuisance, at worst they leave computer users vulnerable to crime and viruses. Emails programs usually allow users to set up filters to restrict the type of emails that enter their inboxes. Some email programs also have a function which allows users to report spam email. Users should never respond to spam messages; they are often sent to addresses which have been randomly generated in huge numbers in the hope that some will prove to be genuine addresses. By responding the user is verifying that the address is genuine, leading to a further onslaught of spam email. Attachments on spam emails should never be opened as these could contain viruses or spyware. Email scams come in a wide range of guises: begging letters; notification of a jackpot win in a lottery that the recipient never entered; or, a too-good-to-be-true investment opportunity. Phishing emails appear to come from a legitimate company, such as a bank, and may ask the recipient to confirm their personal details so that the "bank" can update their system. Sometimes these emails contain links to sites which appear to be legitimate but are in fact illegal clones of the real bank's website. No bank or legitimate company would ever ask a customer to provide confidential personal information in this way. If in any doubt about the legitimacy of this kind of message, users should contact their bank directly. If contacting the bank online, this should be done by typing the address into the browser's address box - not by clicking on a link in the email. Personal information - particularly bank or credit card details - should only be provided online if the page is secure. There are two signs that a page is secure - the page's address should begin with http and a padlock should appear somewhere on the user's web browser page. Double clicking on the padlock symbol will provide further confirmation of the site's identity and the validity of its security certificate. Pharming is the use of fake websites set up to look like legitimate websites in the hope that personal information will be provided. Internet users are automatically redirected to the fake website when, for example, they type in the address of their bank. It can be almost impossible to tell the difference between genuine and fake websites. The relaxed nature of social networking sites may mean that users reveal information about themselves that they would not otherwise publicise. The internet is a very public place and users must exercise caution before displaying personal information. Dates of birth, telephone numbers and email addresses can all be used by criminals for the purposes of identity fraud. Privacy settings can be adjusted to restrict access to users' information. Children are often far more computer literate than their parents and may spend a lot of their free time on the internet. However, just because a child knows how to use a computer it does not mean that they understand the risks that they may encounter online. It is a sad fact of modern life that the internet has been exploited by paedophiles - children have to understand that "friends" they make online might not be who they say they are. Parents must be involved in their children's online activity. Children need to be taught that it is dangerous to give personal information, contact details or photographs to people they meet online. Ideally, children will use computers which are in a communal area of the home so that parents and other family members can monitor their use.